So we decided to put on a show. Not just a drag show, but variety shows with buffet. This was not just a spur of the moment diddy, it was a planned out and rehearsed and re-rehearsed with a dress rehearsal show. A "special occasion liquor license" was granted for the Sunday festivity and full buffet was arranged. Dene Roach The Cigarette Lady ca.1979 I was the director/ producer/ set designer/ builder. Tommy Miller (Sugar), EmeraldGibson, BillMacKinnon? (Miss Iris), Dene Roach (The Cigarette Lady), StephenAmbrose? (Ginger), Chris Shepherd and I cannot remember who else cooked and prepared the roast beef, salads, eggs, cookies and more as well as performing in the show. Glen Hardy, Gerry Gray were on the hand held spotlights made from stove pipes and a 75-watt floodlight in it with a light switch on the back (these I modified from the original lights that I saw from the door of the Green Lantern building). Backstage was setup on the upper level using the top of the stairs as the stage. I used thermal heat blankets as the curtains on the prosceniums and more on a flat surface as the backdrop, some 12"long silver garland, a little silver star was hung above the middle with Christmas lights to add sparkle and color. It looked FABOOOLUS DAHLING! 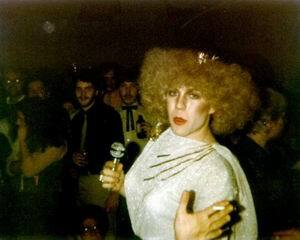 Tommy was a volunteer at The Turret from time to time, he was also known as =="THE GRAND DAME or the DRAG GODMOTHER of all the YOUNGER KID QUEENS"==. Tommy was always ready and willing to help with the makeup or hair or whatever was needed by one of the kids. Using "SUGAR" as his stage name, would mime to classics like "This Is My Life by Shirley Bassey" or "Ertha Kitt". A standing ovation on several occassions, to the GRAND DAME; a well deserved tribute. Tim Hare is another person that I still cannot remember when he actually arrived at the The Turret Club (I do but the fear of telling !). Tim was this little guy with curly hair and a big smile and a laugh that was and is still just a recognizable as today. 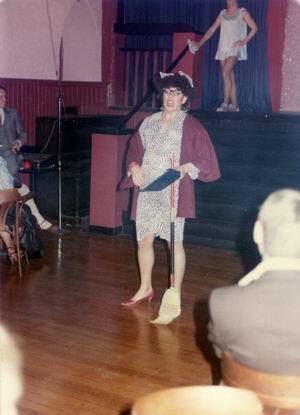 Tim did his first show in 1980 and has been a mainstay ever since, Jenny Blake is probably one of the most recognized drag queens in Halifax. Tim is one of the original members of the cast in my time and also a founding member of G.A.M.E.S (Gay Artists Musicians & Entertainers Society) along with all the other people entertainers I have already written about. People seemed to take to Tim's (JennyBlake) style of "Shut up and sit down" backtalk. Like everyone else at the time, Tim put in his share of volumteer work, staff member and had great input into how the way was being paved to a new style of Drag Queen. You are all grown up now Jenny Blake. Bill soon fit in with our crew of mismatched souls and like many of us became a staff member. I say mismatched in a loving way, each one of us had a character that was very much our own but somehow meshed into a group of co-workers and friendships that has lasted through time. Like all of us Bill did a lot of whatever needed doing at the bar. Soon he had found himself surrounded by a group of friends that had similar interests. Most people took to him as his outward going personality made him very likable.Bill discovered that he liked DRAG and started off as (IrisWheeler) based on a popular soap (you guess which one!) As time went on Bill became a shining star in his own right and an example to other people on how to help and share with one another. "SHE IS GONNA BE "ONE MAD DRAG QUEEN!"" As it turns out John was right on the money. Randy also joined us as a staff member and family member. Over the next few years Randy developed into a DRAG QUEEN STAR, creating several characters (SaraLee, LilyChampagne, Laverne), honing his talents (and what talent it turned out to be). Laverne, my all time favorite that Randy invented and dressed could not only be seen at shows at The Turret but at the concerts on the CitadelHill (concerts were free to all then) or on the waterfront. He made people laugh to the point of tears as he jeered at people playfully and overexaggerated gum chewing, mop pushing maid. 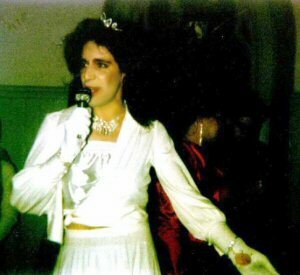 Like most other drag queens of the time, Randy hand made his outfits; some of which seemed just like material from the stage curtain that I had handmade and went missing somewhere. If anyone finds it, please give Randy a call because I have no more use for it. Randy has moved to Montreal and I am not quite sure if a talent has come even close to challenging his rein as Queen of Queens in Halifax. EmeraldGibson just seemed to show up out of nowhwere; I seem to recall he and his sister Etta appeared on the top landing one night (did I miss something?) Em & Etta seemed inseparable, if you saw one; the other was just around the corner. Both appeared to be shy and reserved at first but as time went on the reserved became less but the shyness remained to a degree. EmeraldGibson soon met someone and they had a relationship that lasted for a while. 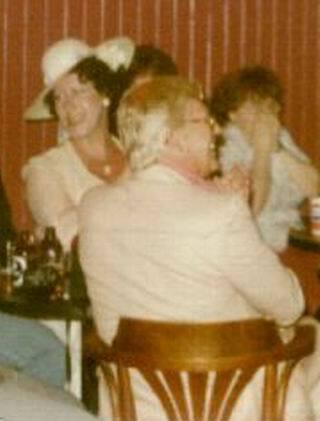 Etta seemed content to be in the company of the people and staff at the bar and was on staff from time to time. EmeraldGibson became the cleaner and also bought out the AlternateBookShop from TommyBurns. I had lost my friendly coversario but soon came to know EmeraldGibson and a new friendship started in a different way. Etta is now married and living in another province, some lucky sailor got her. One night when I had just moved back to Halifax from Toronto a girl (now a woman)stood beside me on the lower section of tables at the second Rumours. We talked for about an hour when she finally looked at me and said:"You don't know who you are talking to do you? "; I replied that I had not a clue. She exclaimed politely that she was Etta. I was set back a bit because this was not the girl that I remembered. I was in shock at how she had matured into this good looking woman (way to go Etta). JoAnne Bond Feeling the blues or like a little old rock n roll ? JoAnne Bond fit that bill, with her raspy renditions of " Mercedes Benz " or "Only Women Bleed". JoAnne seemed comfy on the stage and had a relaxed but raunchy style, singing and playing her guitar. 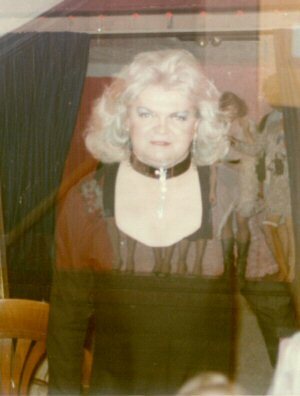 Jo did several shows with us and always pleased the crowd with her onstage antics and showwomanship. I have often thought about her and wondered where she got to. Play it again JoAnne !! Earl (Back On) and Rachael And Etta (1982) Rachael was an American queen. I never knew his last name and I don't know if anyone ever did. I was told that he was an ex-marine and some of us thought he may have been a AWOL. Rachael reminded (me anyways) of an English Dame, his dresses and hats just seemed to have that regal look. 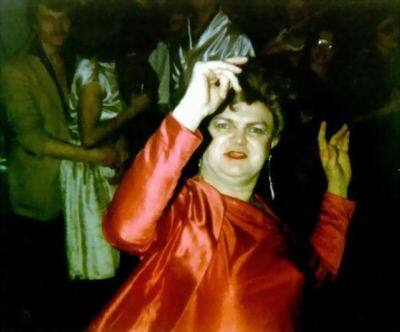 From what I am told, Rachael pretty much lived for drag and in drag and that the neighbours never seemed to know (apparently even in the morning out on the deck at the cottage having a smoke and sporting a morning shadow). Rachael and his partner Earl took part in a few of our shows and or were always part of the audience. Best friends, Travis and Jerry were always together; an inseperable duo.Drag performances by these two were always a treat. Jerry was the only drag performer that I knew that used his own voice to sing along with the likes of Melba Moore and hitting every note ( note for note ) and Travis took his performances very serious and carried his own along with the others. Jerry and Travis are no longer among us and I know that I am not the only one that misses them since they have gone.